This is called jQuery UI Notify Widget, that is similar to the Growl-like scripts we mentioned in the past, except most seem to come with an enormous footprint: 10-12k of code, X-number of images, and roughly 1000 options to support every plausible use case. 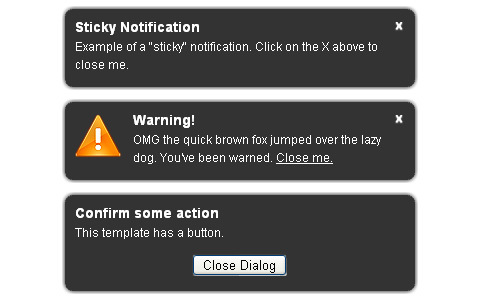 jQuery UI Notify Widget is built off the jQuery UI widget factory in approx. 100 lines of code and 100% CSS. In typical widget fashion, this implementation supports the most basic uses, but is flexible enough for more advanced cases. Very nice. This is a great implementation of growl. So you’re advocating replacing a 10-12kb script file with a 342kb script file? That’s how big the jQuery UI JS file is in the demo. It’s done very well and if you’re already using jQuery UI for a project then this seems like it would be a good addition, but if you JUST want growl-type notifications then this is probably not the best option for you. The widget’s only dependency is the widget factory from jQuery UI, which is only 2.9kb minified. I load the whole thing in for ease and to take advantage of Google’s CDN.